Sri Swamiji’s thoughts are ever fixed on Lord Sri Venkatesha, the seven hills, Ananda Vimanam (canopy over the main sanctum sanctorum), Lord Varaha and the holy waters of Swami Pushkarini (holy pond within the Tirumala temple precincts). In his dhyana… Sri Swamiji walks up the holy hill of Tirumala doing Nama kirtan and moved by the enchanting hills; bathing in Swami Pushkarini with great joy he goes and has darshan of Lord Bhoovaraha; then, passing the divine guards Jaya and Vijaya at the entrance of the main sanctum sanctorum, Sri Swamiji stands on the Kulasekara step and worships the Lord even as he recalls the words of Kulasekara azhwar, “Will I not remain in Thy presence as the stair and enjoy the sight of Thy red lips!” and yearns to occupy that position of the Azhwar. While worshiping the Lord in this manner in his dhyana, Sri Swamiji enjoys bliss as he pictures himself enjoying Ananda Vimana even as he bathes in Swami Pushkarini filled up to the brim by heavy rains and the tender shoots and flowers of Tirumala floating on it. While thus bathing in Swami Pushkarini he also pictures himself holding the little form of Sri Sundara Srinivasan on his head and taking several dips. 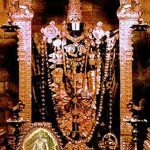 Once out of his dhyana, looking at Sri Sundara Srinivasan he says, “I have not made the trip to Tirumala but I will send you there with someone. You can go with him and take holy dip in Swami Pushkarini.” But little Lord Sri Sundara Srinivasan does not desire that. Sri Swamiji also hesitates sending Him with someone else, as he fears His safe return to him. Recently, Sri Swamiji was in Bhagavata Bhavanam at Madhurapuri Ashram, chanting Nama. Outside it was raining heavily. At once Sri Swamiji’s mind was filled with thoughts of Lord Venkatesha and Swami Pushkarini. He at once went to Narayana Saras (the pond adjacent to the Ashram’s Sri Kalyana Srinivasa temple). As pictured by Sri Swamiji in his Dhyana, the pond was overflowing with water. Several flowers and tender shoots were floating on it, giving it sheer aesthetic beauty! To Sri Swamiji it was not Narayana Saras in Madhurapuri but verily Swami Pushkarini spread out before him. Narayana Saras was to him Swami Pushkarini. He at once stepped into it and enjoyed bliss bathing in it. In the evening when Sri Swamiji came to Sri Premika Varadan’s sannidhi he found Sri Sundara Srinivasan with a grim face. Sri Sundara Srinivasan was angry with Sri Swamiji! Sri Swamiji at once realized the reason behind it. “Oh my! Have I not always pictured holding Him on my head while bathing in Swami Pushkarnini! But this morning I have had my bath in it without Him. That has made Him angry!” Waiting restlessly for the day to dawn, Sri Swamiji, as soon as it dawned, took Sri Sundara Srinivasa with him went to Narayana Saras which to him was verily Swami Pushkarini. Holding the Lord on his head Sri Swamiji bathed in those waters. Only then did the face of the Lord bloom with joy! Then Sri Swamiji sat in a corner of the pond’s bank to do his daily religious rituals. A stone mandap designed long back was in the corner. A slight movement of his eyes was enough for his devotees to arrange everything quickly. Some devotees moved the stone mandap from the corner and cleaned it with water. After painting it with red paste, a garland of mango leaves was tied to it. Soon the mandap was decorated beautifully. Sri Sundara Srinivasan sat in it. A lamp made of millet flour (thinai) was lit. Further, Sri Swamiji went around the pond doing Nama sankirtan, accompanied by the fan, umbrella and other paraphernalia. Sri Sundara Srinivasan’s joy that day was beyond all verbal description. Though not planned beforehand such a wonderful event took place in the most divine way. The way Lord Sri Sundara Srinivasan was celebrated gave immense joy to Sri Swamiji. Many Utsavs are well-planned and celebrated here. Yet, the beauty of the Lord fulfilling at once such exceptional Utsavs arising suddenly in Sri Swamiji is unparalleled! Is there a greater joy for us than experiencing these?